Aim is to make the best 4 card low hand with all cards of a different suit and numerical value, Ace counts as low. 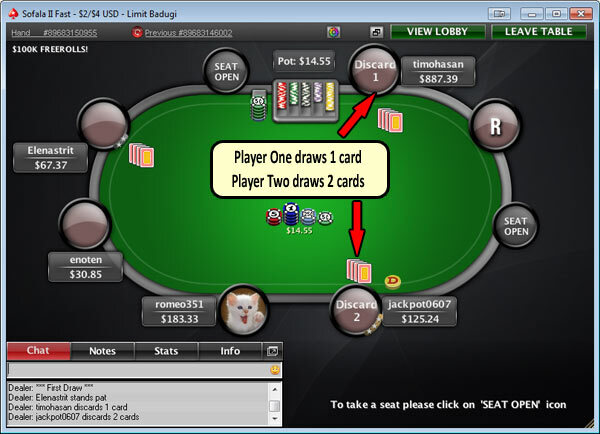 Badugi is a new variation of poker that originated in Asia and is becoming more and more popular, especially online. Badugi is a Draw Poker based game and is a four card game where players can draw up to three times to try and get the lowest possible hand. The big difference to this game and all other poker games based on getting the lowest hand is that in Badugi the Suits of the cards also play a part and can count against your hand if you have cards of the same Suit. So… How do you play Badugi Poker? Each player will receive four cards face down from the dealer which only that player can see. The object of Badugi is to have four cards all of different numerical value and all being of different suits, trying to have the lowest four cards possible. The best possible hand you can get in Badugi is A – 2 – 3 – 4 all of different suits. During the hand each player will have the opportunity to swap any, all or none of their four cards with each drawing round. This is called to “draw” cards. There are usually three drawing rounds per hand but the number of rounds can range from one to three depending on the game/tournament you enter. The big difference with Badugi Poker compared with other games requiring the player to get the lowest hand is that Suits count. You want all four of your cards to be of different suits, so one each of clubs, spades, diamonds, and hearts. The best possible hand you can get is 4 – 3 – 2 – A that are all of different suits. Player Two’s highest card is an 8 which is lower than Player One’s 9 and so Player Two has the best hand. See the “Types of Badugi Hands” section below for more hand examples and explanation. A marker called the “Dealer Button” will go around the table, one seat at a time after every hand has been completed in a clockwise rotation. At the start of every hand two selected players will be forced to put a small amount of chips into the pot. This forced bet is called “the blinds” which ensures there are always chips to win with each pot. The player sat immediately to the left of the button will put in the small blind and the player sat two spaces to the left of the button will put in the big blind. The big blind amount is usually double the amount of the small blind. The size of the blinds are determined by the stakes that are being played. The stakes at a table will be referred to with two numbers, for example $0.05 / $0.10. In this example the small blind would be $0.05 and the big blind would be $0.10. Once the Blinds are in the pot each player will receive four cards face down from the dealer which only they can see. The dealer button is used to establish the order that the cards are dealt in with the first card being dealt to the player to the left of the dealer button and last card to the player with the dealer button in front of them. After all players have received 4 cards then a round of betting will commence. The first round of betting will begin at this point, starting from the player sat to the left of the big blind (as the small and big blind have already acted by putting their blind bets into the pot). Fold – they can fold which means their cards are discarded and they will play no further part in that hand. Call – they can call which means they put in the same amount of chips as the last acting player. This amount will be the same as the big blind amount unless some one acting before them has made a raise. Raise – lastly they can raise which means they put in more chips than the current bet and all other player must match this amount in order to continue in the hand. Each player will take their turn to act in a clockwise rotation until all players who remain in the hand and have not folded have put an equal amount of chips into the pot. Once all players have either folded or put in matching amount of chips into the pot then the remaining players take part in a Drawing round. In a Drawing round, each player can swap up to four cards in their hand. If a player does not want to swap any cards then they don’t have to. The action always starts with the first active player sat closest to the left of the dealer button. Once all players have chosen the number of cards to draw in order to try and improve their hand a second round of betting commences starting once again from the first active player to the left of the dealer button. In exactly the same way as previous rounds each player will be allowed to select a number of cards to swap. After each player has selected their draw then a third round of betting will commence. Each player still active in the hand has now had two chances to Draw and Bet. A third and final round now takes place where once again the players can draw cards and at this point all players will know what their final hand will be. Then a final round of betting takes place. During each of these betting rounds Players only have to put chips into the pot if a bet is made. If a player does not need to put more chips into the pot nor wants to make a bet themselves then they can check which means the action will go onto the next active player. If all players check the next stage comes about. Now that the final betting round has been completed then we need to decide who has the best hand in order to award them the winners pot. All remaining players in the hand will now reveal their cards at the Showdown to decide who has the best hand. 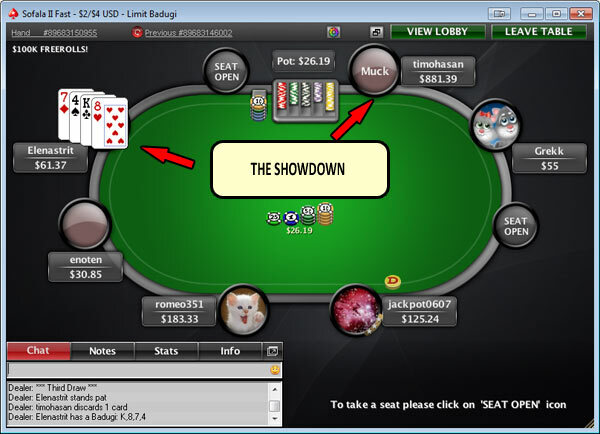 The player with the best low Badugi poker hand will be declared the winner and awarded the pot. If the hands are tied then the pot will be split equally between all players that are tied. There are four types of hands in Badugi depending on how many active cards you have. Take a look at the hands below which will explain in detail how it works. If a player has a hand where all four cards are different in numerical value and suits he has a four card hand which is also called Badugi. The only way a player can lose while holding Badugi is by another player who has also made Badugi but has a lower value high card. If a player ends up with two cards of the same value or two cards of the same suit he can only use one of those cards in his final hand. The worst card of the two will be discounted which means the player only has a three card hand. If a player has a three card combination included in the four cards in his hand either by having the same value card or the same suit then the two worst cards in that combination will be discounted which means that player only has a two card hand. A one card hand is the worst possible hand to have. This means that only one card of the four received is active due to the suits or value of the cards all being the same. Badugi is a real breath of fresh air for those players who have played many thousands of hands of standard versions of poker like Texas Holdem. It is a completely different card game and can be really fun and refreshing. Badugi is not as popular as other variants online so you need to ensure that you choose an online poker site that has Badugi tables running. If you want to try Badugi then you should head over to our Play Poker section where we can recommend to you an online poker site that is trusted and also offers Badugi Poker games. Practise is the best way to learn, so pick a low value stakes Badugi table and just experiment until you get used to all the stages above.